Not everyone loves leftovers so the secret is to transform them into something new and delicious. 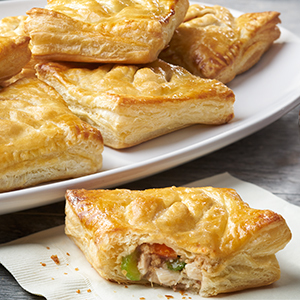 With these hand pies, all of the goodness from holiday leftovers is wrapped up in flaky puff pastry and baked to perfection. Cranberry sauce combined with gravy adds a savory sweetness to your turkey, stuffing and veggies. Its like holiday dinner in every bite. Heat the oven to 400°F. Stir the stuffing, turkey, 1/4 cup cranberry sauce, gravy and vegetables in a medium bowl. Sprinkle the flour on the work surface. Unfold 1 pastry sheet on the work surface and lightly roll to remove the fold marks. Cut the pastry sheet into 3 (about 3-inch wide) strips. Cut each strip crosswise into 3 (about 3-inch) squares. Repeat with the remaining pastry sheet, making 18 pastry squares in all. Beat the egg and water in a small bowl with a fork. Brush the edges of 9 pastry squares with the egg wash and spoon about 1 teaspoon remaining cranberry sauce in the center of each. Top each with about 2 tablespoons stuffing mixture. Top with the remaining pastry squares, stretching slightly to cover the filling, and crimp the edges of the top and bottom pastries together with a fork to seal. 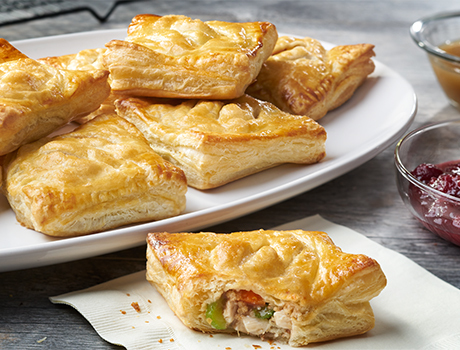 Place the filled pastries onto a baking sheet. Using a sharp knife, make 3 small cuts in the top of each pastry to vent. Brush with the egg wash.
Bake for 20 minutes or until the pastries are golden brown. Serve with additional gravy or cranberry sauce, warmed, for dipping. Flavor Variation: Add 2 teaspoons your favorite chopped fresh herb to the stuffing mixture, if you like! Easy Substitution: You can substitute any leftover vegetables for the green beans or carrots in this recipe.